Appearance: He has long black hair, his eyes in their standby from are silver. first stage of his Sharingan is red second stage of it is blue and the third and final stage is a mixture between two Sharingan's right eye White, Left eye Blue. he has Two sword one of which is on his back and the other is fastened to his waist, this allows him agile movement in his quick dodge efforts. Personality: Sadara is a mild tempered impatient male. he only uses energy when it is required one of the reasons he was able to become an Anbu Assassin. his skills of Ultilizing low level Genin through academy level jutsu's to defend himself without draining his chakra is a great asset to him. As well as his more Bigger chakra consuming jutsu's. He is skilled in the way of Assassination, he sometimes would be seen on rescue missions or just out and about. He's easy to make friends with but sometimes will not act as if he does. He hates liers and thiefs, he's some what cocky at times when he battles, because like i said earlier he most the time uses low level jutsu's to get out of alot of things which alot of times pisses his opponent off and causes them to lose focus and create and opening which in turn allows him to push his cockiness aside and go in for the higher level jutsu's. He is very protective of his fiends when it come's down to the people he cares about he is never too far from the action. He dislikes conflict but will kill in the matter of a second if tested, he also is the second brother of Madara being his twin so that make's three. History: Sadara is the twin brother of the late great Madara he is more of a calm and settle fellow though he acts cocky. He was born about the same time as madara but stayed in the shadow's alot. He was the one who refused to give Madara his eyes after he had went blind thus creating a fued between the two. His mother and father both died. When he was 11 he was a chunnin and at 14 he was a Jonin and when he turned 16 he was inducted into the Anbu Rankings. His brother knew him all too well and felt that he wouldn't even make it through basic training but to Madara's surprise he passed and made the top of his class. Being able to see the chakra trail of other was a great asset to him as well and which gave him the Anbu ranking of Assassion meaning being able to find you and track you down and kill you. 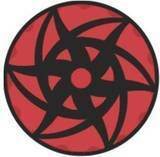 In his sharingan's third state he has Two different Sharingans one which is white and the other which is blue. This is because His best friend was dying and he gave it to him upon a whim, but he took a common regular eye from a dying special jonin and converted it into a New Sharingan which was white. this gave him a surprised advantage against Madara when they fought. this fight was right before Itachi and Madara met which is why Itachi's first meeting with MAdara Was in the shadows as to where Itachi couldn't see Madara because MAdara was ashamed to be so badly bruised by his younger twin brother. His life now settle he returned back to the anbu force and that's where he stayed, Knowing one day his brother would return in search of his eyes. Sadara is not married nor does he have any kids and he believes that love is only common in those who seek it. He is the future trainer of Konohamaru And his squad, he takes a special liking to the boy and the young girl of which he teaches them everything and they grow up to become great shinobi. 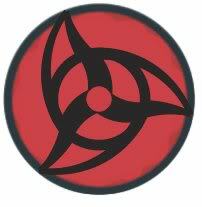 The other child was trained in secret and was a very skilled tracker he was later inducted into the Anbu Tracker. He is sometimes a Support ninja to Sadara on special Missions. Sadara seeks only to improve the skills of others and better everyone around him and make sure that Kohonoha will be Safe. Jutsu: Ninpou, Kawara Shuriken, Katon Ryuuka no Jutsu, Shuriken, Kage Bunshin no Jutsu, Mikazuki no mai, Fuuinjutsu Shiki Fuujin, Doton Doryuuheki, Souja sousai no jutsu, Katon, Goukakyuu no Jutsu, Katon, Karyuu Endan, Katon, Housenka no Jutsu, Gogyo Fuuin, Gogyo Kaiin, Kirigakure no Jutsu, Senai Jashuu, Kuchiyose Edo Tensei, Kage Bunshin no Jutsu, Mizu bunshin no jutsu, Suiton Daibakufu no Jutsu, Suiton, Suijinheki, Suiton, Suiryuudan no Jutsu, and Suirou no Jutsu. Future "Eternal"- Hope you would never see it! I think you're fine as an ANBU Black Op and Jounin, as it appeals to me that you're worthy for it and understand its role. Ah sorry, but I'm not really an admin here, just a mod. But if you go to "Profile" and click on the "Shinobi Information" tab, you can give yourself that rank. I'll also see if i can get an admin on. Cool Also i would like to battle you are you up for a some what of a spar? Yeah sure, we can do it in Kirigakure or Konohagakure.